Noble gamer. Samsung introduces the Samsung Series 7 700G7C, a high-performance gaming notebook that seeks to extend the premium Series 7 family. Featuring an Intel Core i7 quad-core processor, the Nvidia GeForce GTX 675M, 16 GB RAM, a Blu-Ray drive, and illuminated elements, the elegant piano black lacquer notebook is a high-quality device with a price to match. 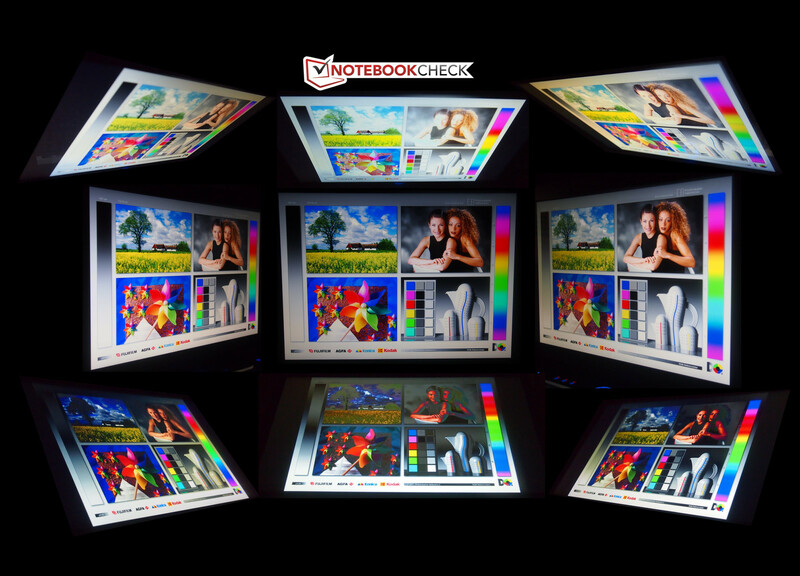 The gaming notebook sector is a highly sought segment of the notebook market. The upper-end of this segment is currently occupied by devices from well-known manufacturers such as Alienware, Asus, and Schenker. These manufacturers are known for using high-performance hardware, generous equipment configurations, and stylish and often futuristic design elements. 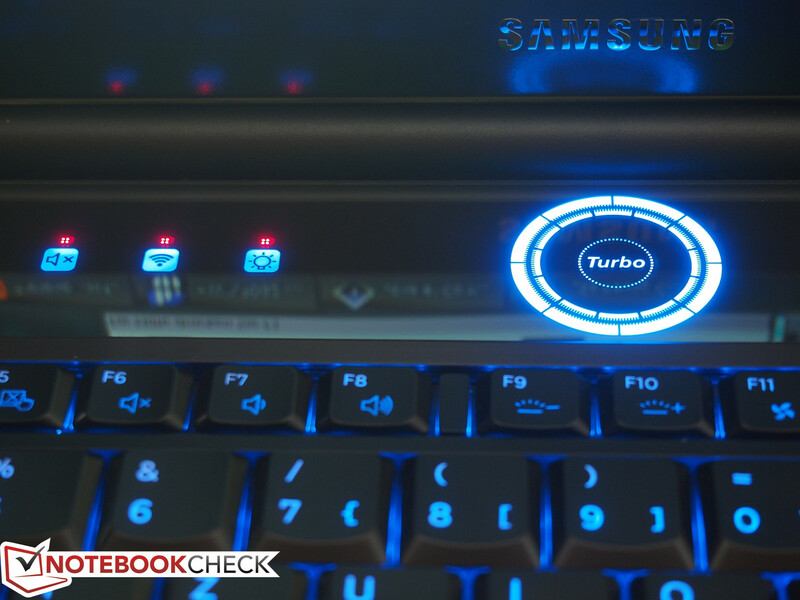 With the Series 7 700G7C, Samsung steps into the gaming notebook ring once again. 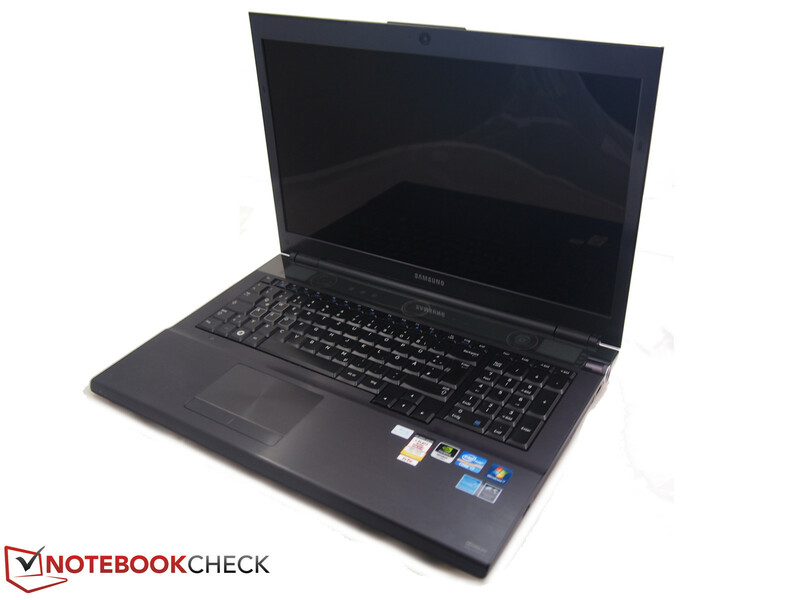 The Series 7 700G7C gaming notebook uses the Ivy Bridge Intel quad-core i7-3610QM processor that is often considered the entry point to the high-end CPU category. The premium Nvidia GeForce GTX 675 graphics card is capable of handling current, performance demanding games and is appropriate for a gaming notebook. While great on paper, the 16 GB system memory is more than sufficient. 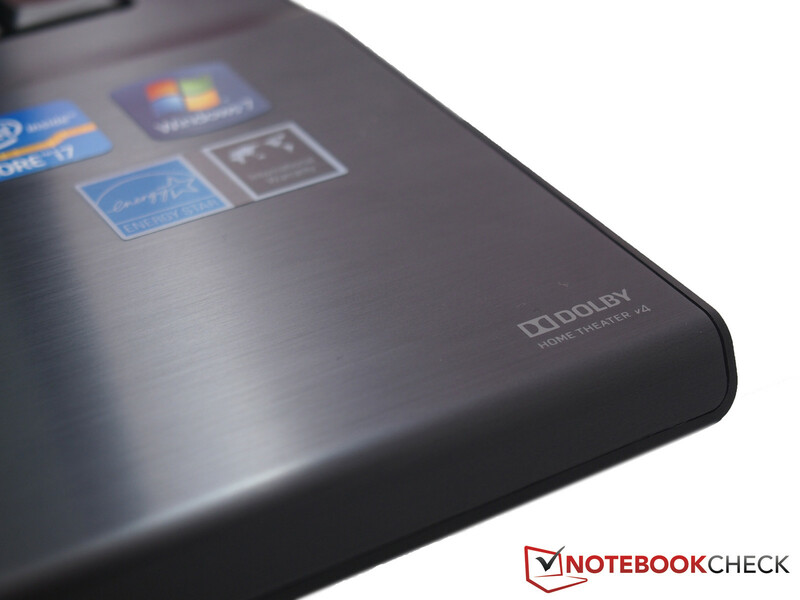 The gaming notebook features a 17-inch 1920x1080 display which also allows the integrated Blu-Ray drive to render movies in native Full High Definition video. The 2.1 sound system features a dedicated subwoofer – a must in gaming notebooks – which makes the notebook a good all-around multimedia device. 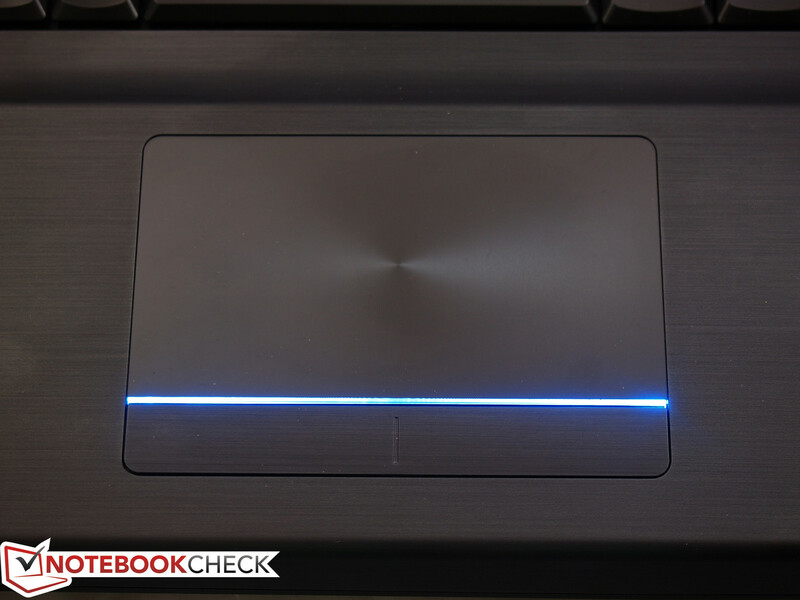 Throughout this review, we compare the Series 7 700G7C to both the sector-leading 17-inch Alienware M17x R4 and the interesting Schenker XMG P702 PRO. By comparison, the former uses a Radeon graphics card and serves as the 700G7C’s direct competitor. The latter opponent can also be optionally configured to use the same Nvidia graphics card. 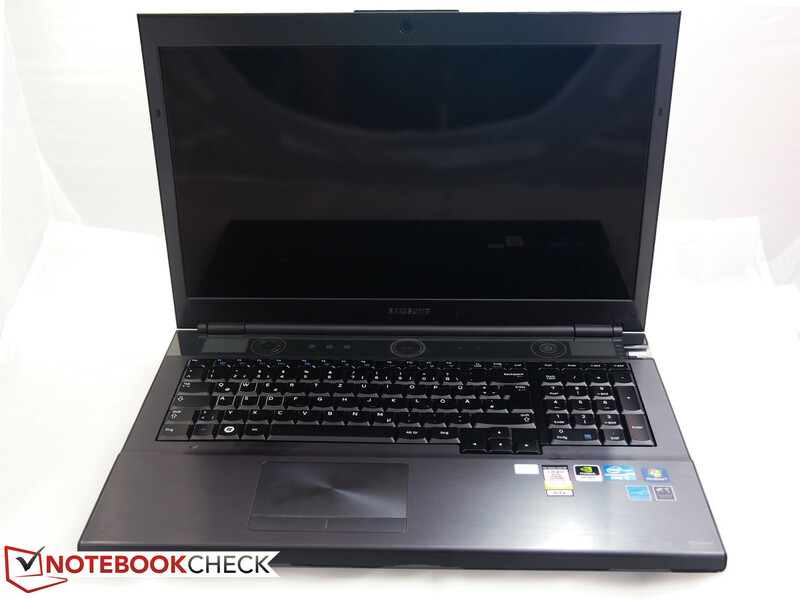 We also compare the 700G7C to its predecessor, the Samsung Series 7 700G7A which used the AMD Radeon HD 6970M. According to the Samsung website, the 700G7C can also be configured to use a Radeon graphics solution. The Series 7 700G7C uses the same case that was used in the preceding Series 7 700G7A. The high-gloss, plastic surface used in both cases is highly sensitive and every touch inevitably leaves fingerprints. Even the matte wrist rest is not impervious to these visible signs of activity. As a result, a microfiber cloth is a required accessory for the notebook. Nonetheless, the design appears attractive and high-end. The display lid’s piano black lacquer is eye-catching and small details such as the transparent, glass-like bar above the speakers upgrade the notebook’s style. Both the aforementioned bar and keyboard have illuminated elements which immediately make a good impression when the notebook is turned on. 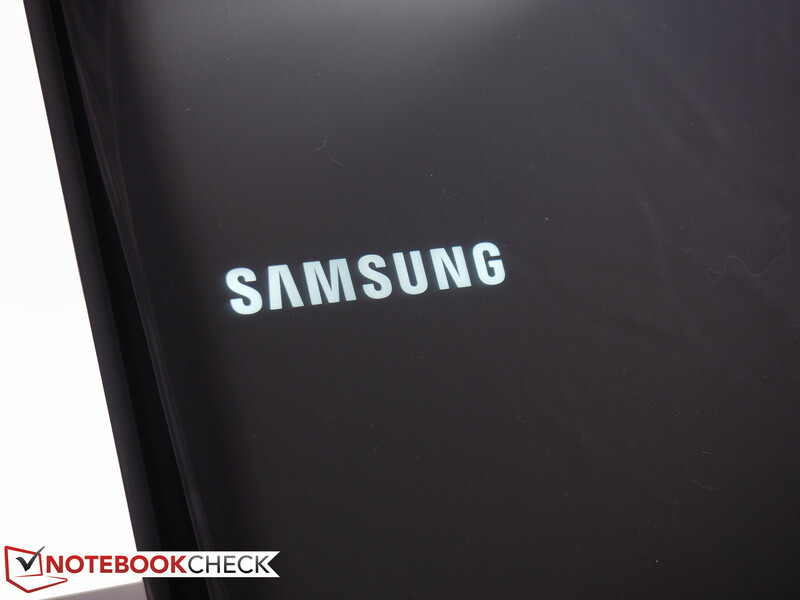 The glowing white Samsung logo on the display lid also appears at startup. In contrast to the preceding model, the dotted display frame pattern was not reused and the frame is now simply solid black. We found no flaws in workmanship and the material transitions did not exhibit gaps or other irregularities. With regard to stability, the base unit made a rather rigid impression even if the display itself was not particularly stiff. The maximum opening angle of approximately 120 degrees is not particularly wide when compared to other top-end models that can be opened to nearly 180 degrees. The display hinges demonstrated a firm grip on the display in every position. 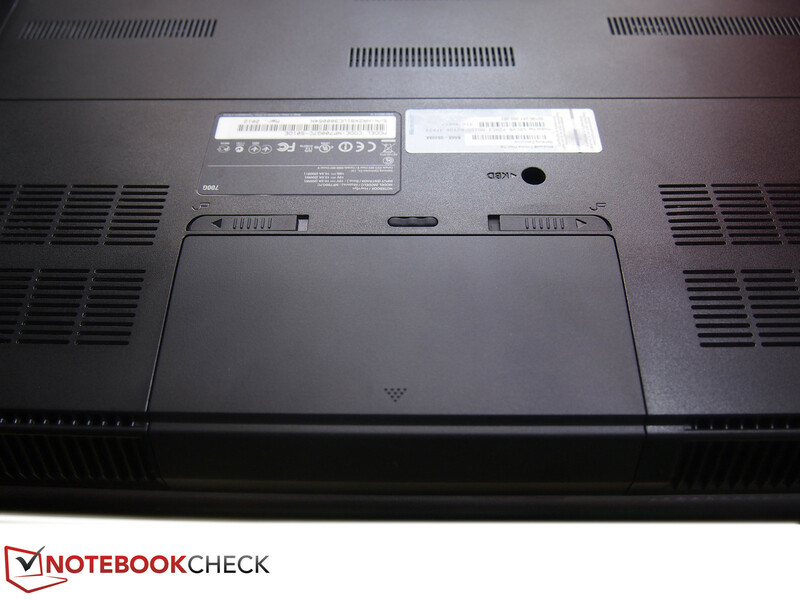 As with the predecessor, the Samsung Series 7 700G7C is not a lightweight with a measured 4 kilogram (9 pound) weight. This is the compromise that must be made in order to achieve a high-performance device with a large 17-inch display and two hard disks. For those seeking a lighter notebook, Samsung offers the Series 7 700Z3A-S03DE which weighs only half as much. The Series 7 700G7C retains the connectivity options of the previous 700G7A. The notebook lacks fancy features but provides the typical two USB 3.0 ports on the left and two USB 2.0 ports on the right. These ports are placed sufficiently far apart to allow larger plugs and devices to be used simultaneously. 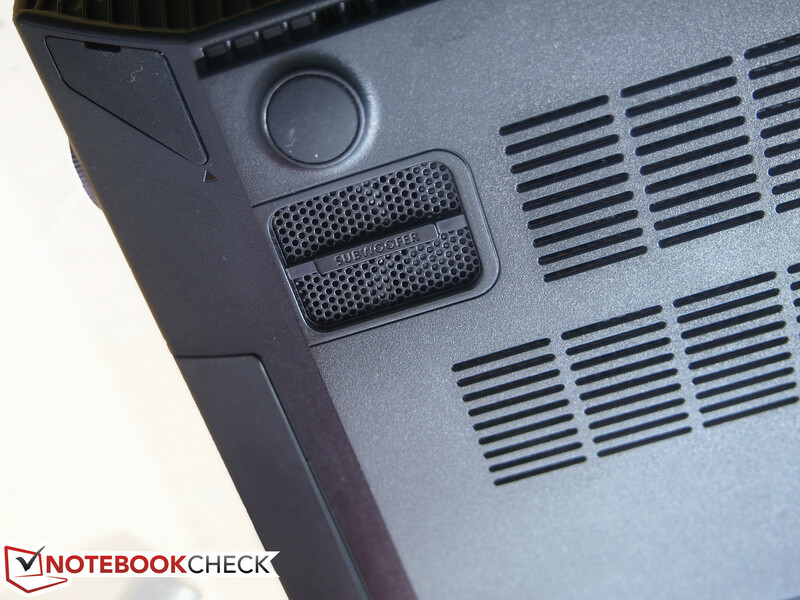 We found the two audio jacks for microphone and line/audio out to be a bit modest as other gaming notebooks such as the Alienware M17x R4 and Schenker XMG P702 PRO feature four jacks to enable the direct use of a multi-speaker surround environment without the use of an external receiver. While the DisplayPort on the left is a nice addition, eSATA, Firewire, and ExpressCard would have been reasonable additions considering the notebook’s price but are unavailable. The built-in webcam in the display bezel has a 2.0 megapixel resolution, sufficient for video telephony but also not particularly generous. The webcam, which has a blue LED indicating activity, worked flawlessly and smoothly in our Skype test call. Nonetheless, webcams do not offer outstanding pictures and our notebook’s camera is no exception. While the webcam can take 1920x1080 snapshots using the included YouCam software, this is hardly a standard of quality. The Series 7 700G7C makes use of the Intel Centrino Advanced-N 6235 wireless module to provide all Wi-Fi standards – 802.11a/b/g/n – with a maximum communication speed of 300 Mbit/s. The same module also provides Bluetooth 4.0, the latest version of Bluetooth, which is more energy efficient than previous versions. This advantage, however, is more relevant for smartphones and tablets than for energy-hungry gaming notebooks. The Series 7 gaming notebook only includes minimal accessories. The notebook comes with the corresponding power supply and a recovery disc. In terms of software, the story is essentially the same. 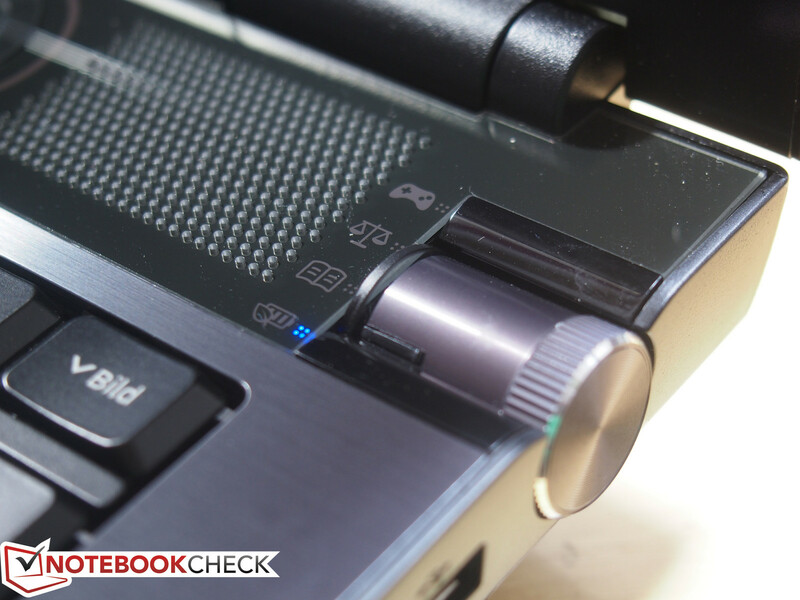 Aside from some bloatware, the notebook includes CyberLink Media Suite which provides an alternate media player as well as some media conversion capabilities. The CyberLink YouCam application is also included and allows the user to take snapshots and record video using the built-in webcam. A maintenance cover on the Series 7 700G7C’s underside is held in place by one screw. This cover only grants access to the two hard disks and two of the four 4 GB memory modules. Both hard disks use rubber cases to prevent vibration and provide a secure fit in the drive slots. The other components can only be accessed by disassembling the entire base unit. 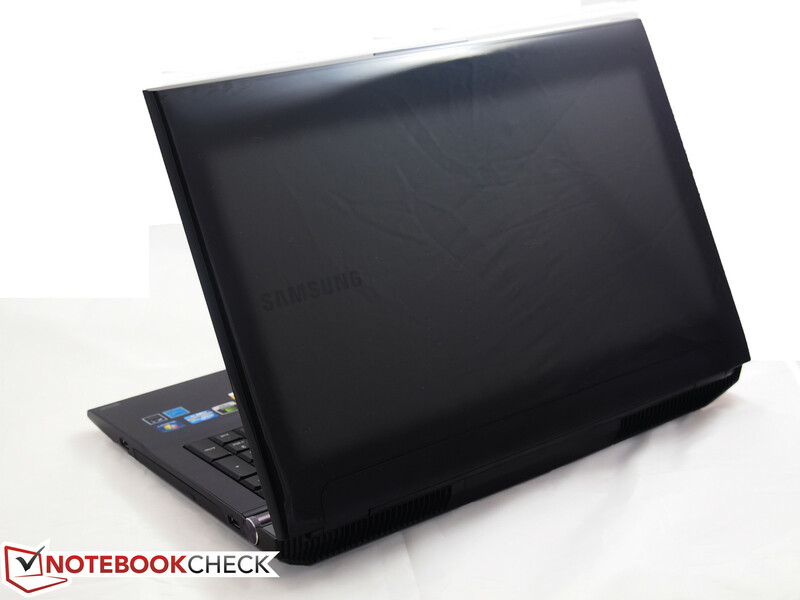 Samsung’s notebook is covered by a standard 24-month warranty. Warranty service includes free repair in a Samsung authorized repair shop or exchange with an equivalent successor model at Samsung’s discretion. The warranty period can also be extended to 36- and 48-month durations with the latter costing an additional 99 Euro ($125 USD). While most notebooks use chiclet-style keyboards with square-shaped keys which are separated by gaps and level with the surrounding case surface, Samsung chose to use a conventional alternative for the 700G7C which features beveled keys that are directly next to each other. 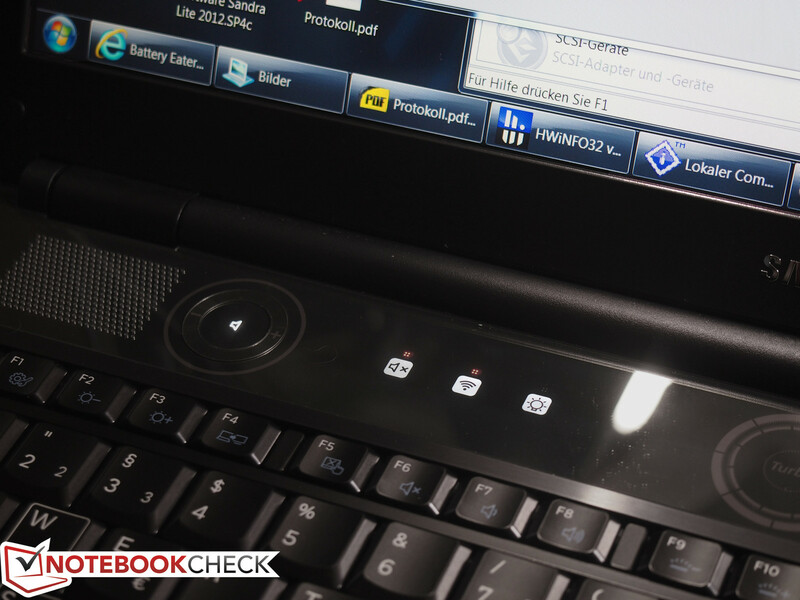 We found this version of the keyboard to be substantially similar to those of Alienware notebooks. The keys in Samsung’s solution have a fairly soft stroke that will likely be found more appealing by gamers than prolific typists. Nonetheless, it is ultimately a matter of taste and preference whether the short, crisp key drop of many chiclet keyboards is preferable over that of the Samsung keyboard. 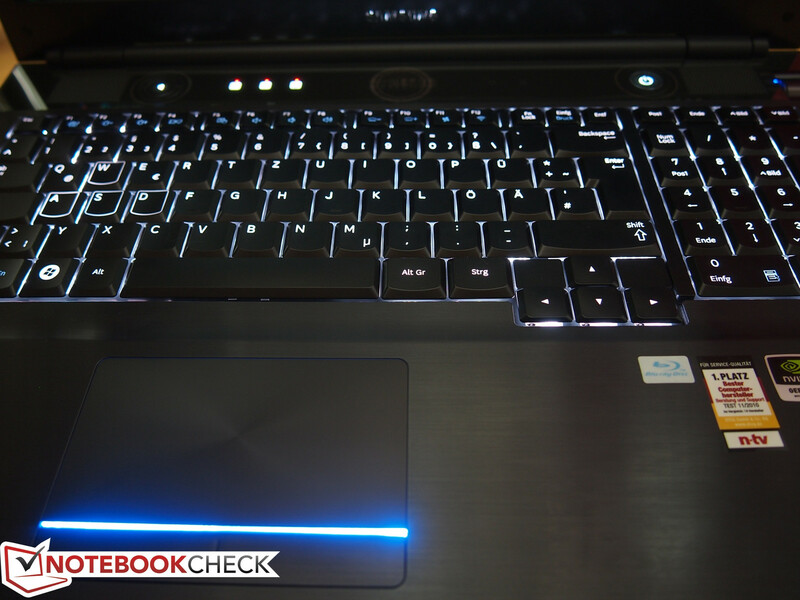 The notebook’s keyboard also features illumination as a visual highlight. Depending on the energy settings, the gaps between the keys can be lit in white or blue lighting. In either case, working in absolute darkness is not a problem and the backlight’s intensity can be adjusted to one of eight levels using an Fn key combination. The fan can also be manually disabled via the keyboard in scenarios where silence is preferable. An additional feature is a dial on the device’s right side which is used for enabling one of four predefined energy-saving options. In addition to the typical high-performance and power-saving modes, a “Balanced Mode” and a “Library Mode” are available with the latter prioritizing low-noise operation. As with the preceding Samsung 700G7A, the touchpad of the Series 7 700G7C is a generous 103 x 55 millimeters (4.1 x 2.2 inches). 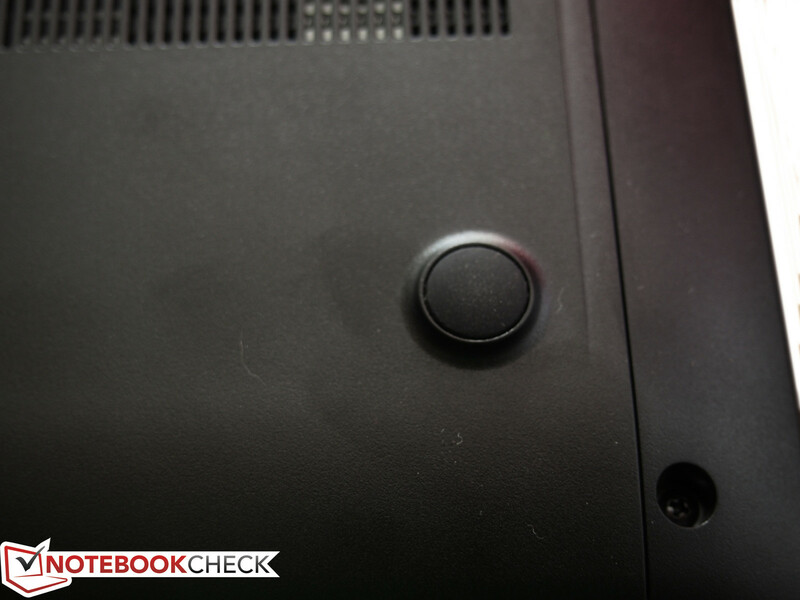 The touchpad, which is virtually unchanged, has a smooth surface that allows fingers to easily and precisely glide. Multi-touch gestures such as pinch-to-zoom, two-finger scrolling, and one-finger edge scrolling are enabled by default. Even the integrated buttons’ loud click noise is retained. The Samsung 700G7C uses a 17-inch LED-backlit 1920x1080 display. Similar to the predecessor, the Full HD 16:9 aspect ratio display provided outstanding results in our tests, with a top-tier average brightness of 328.6 cd/m2, a good black level of 0.41 cd/m2, and a first-rate corresponding contrast ratio of 827:1. In fact, the only observed drawback of the display is the glare-type glossy surface which might become annoying in bright surroundings. Fortunately, the screen’s excellent luminosity compensates for this quite well. In this regard, the Samsung 700G7C’s display outperformed the gaming sector leading Alienware M17x R4 whose screen does not reach this brightness level. Image quality in head-on and near head-on viewing was above average. However, as with all TN (twisted nematic) screens, display distortions such as color inversion and image fading occurred at vertical deviations of 45 degrees and larger. Image stability was maintained for considerably larger horizontal deviation angles. The Series 7 700G7C features the Intel Core i7-3610QM, which is generally considered the gateway to the realm of high-end quad-core processors, and the Nvidia GeForce GTX 675M, a high-end discrete graphics card. The 16 GB of system memory is perhaps overkill for current computational needs. All four memory banks are occupied by 4 GB modules. The storage solution features two 750 GB physical hard disks. 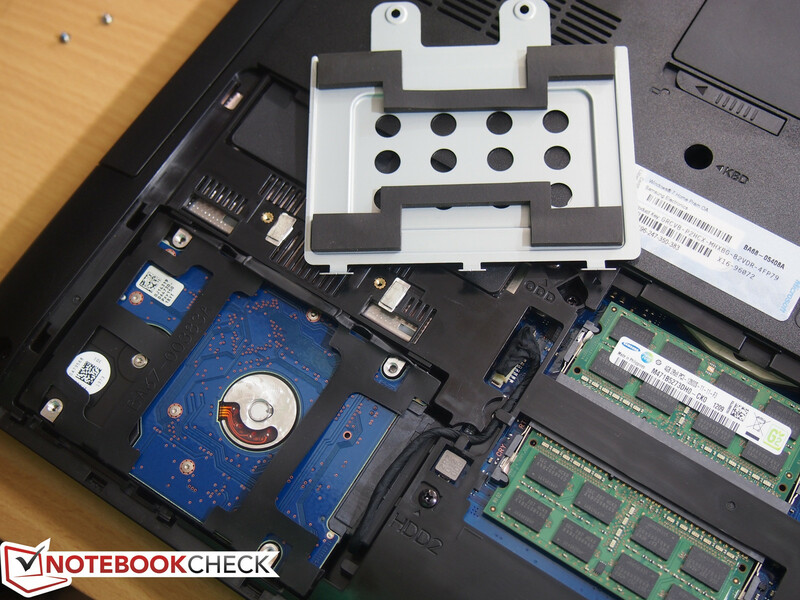 While solid state drives (SSD) are more often typical for high-performance notebooks, Samsung chose to use a hybrid ExpressCache solution whereby frequently used system data is stored on 8 GB of flash memory which speeds up system booting and program starts. 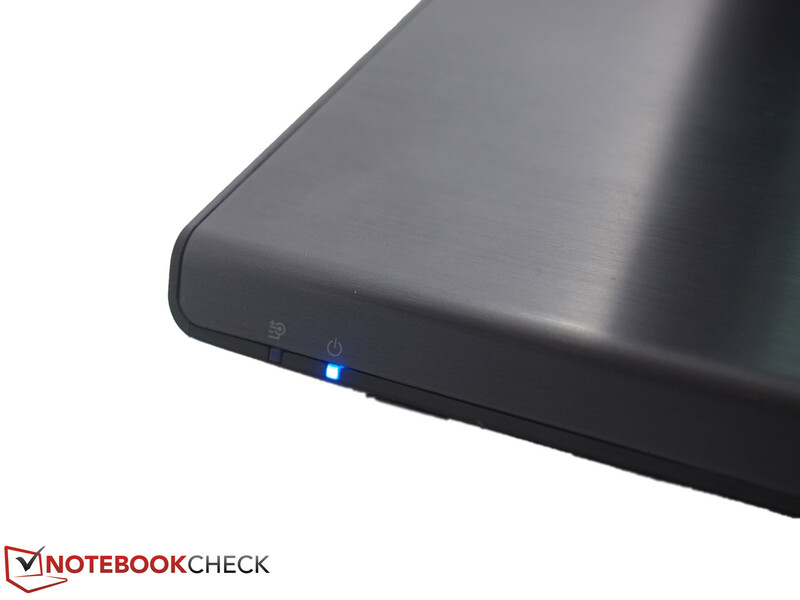 Subjectively, the Samsung notebook woke up from a sleep state rather quickly in our tests. Nonetheless, the hybrid solution is unlikely to match the performance of even a single SSD. The quad-core Intel Core i7-3610QM is a frequently used, current, upper range CPU with a good performance to price ratio. 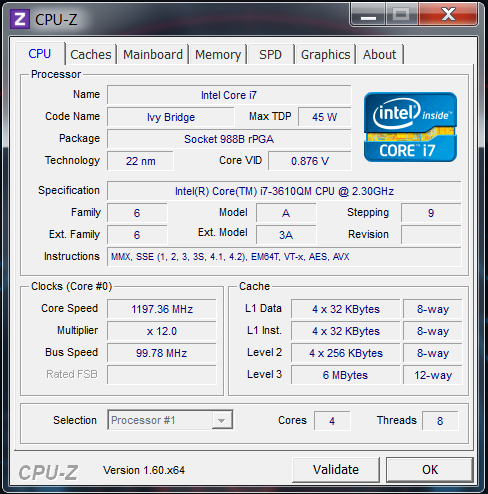 As part of the current Ivy Bridge generation, the CPU is built on a 22 nanometer process and features Intel Hyper-Threading technology which allows each core to simultaneously process two threads. 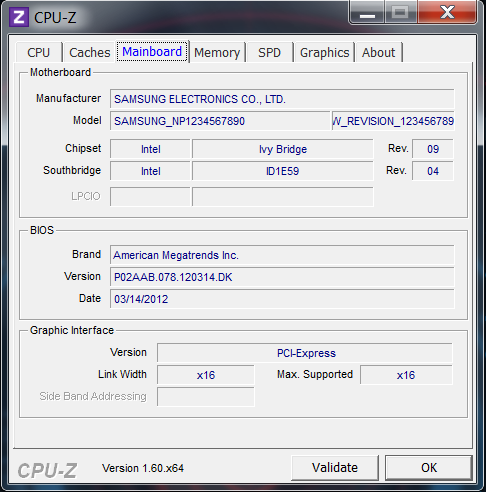 The latter allows the CPU to handle eight threads simultaneously. With a 2.3 GHz base clock, the CPU is capable of running at 1.2 GHz during energy-saving idle operation and up to 3.3 GHz during single-core operation using Turbo Boost. Unfortunately, Turbo Boost is unavailable on battery power and the processor clock never exceeds 2.3 GHz in this situation. As a result, demanding applications will perform better on AC power. We tested the Samsung Series 7 700G7C using the Cinebench CPU benchmarks and the notebook provided the expected good results. Our measured results were not significantly lower than those of higher-end CPUs such as the Core i7-3720QM. By comparison, the preceding Series 7 700G7A and the Schenker XMG P702 PRO we tested in April both use the Sandy Bridge Core i7-2630QM. The gap between the 700G7C’s Ivy Bridge CPU and the Core i7-2630QM was more obvious as our Core i7-3610QM scored up to 25 percent higher in the rendering benchmarks. 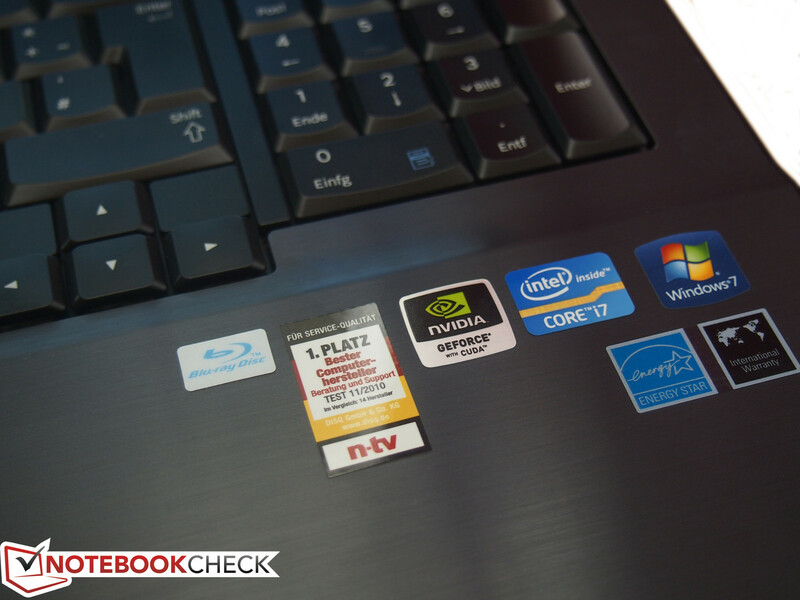 To determine overall system performance, we used the PCMark series of benchmarks. As expected, the Series 7 700G7C achieved results that were a bit higher than those of the predecessor. Nonetheless, the score was only half of those of the Alienware and Schenker options. The reason for this enormous gap is that the two competitors both use SSD storage devices which are capable of read and write speeds that are half an order of magnitude higher than those of the Samsung notebook’s physical disks. An SSD would make the transfer of data, system boots, and program starts much faster in typical use. As mentioned previously, the Series 7 700G7C uses an 8 GB SSD as a system cache. While SSDs provide a significant performance gain, it is unclear whether the relatively quick program starts in the 700G7C are due to the ExpressCache or the 7200 RPM hard disk. 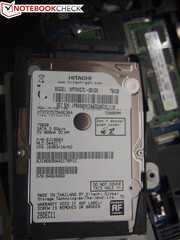 The Samsung 700G7C uses two 750 GB 7200 RPM Hitachi HTS727575A9E364 hard disks, each of which has a 16 MB cache. We measured an average read rate of approximately 98 MB/s, placing these drives in the upper range of conventional magnetic storage devices. Nonetheless, these drives fall considerably short of the read rates of the SSDs we would expect to find in such an expensive high-end notebook. The quad-core processor is paired with a high-end graphics card, the Nvidia GeForce GTX 675M. This graphics card should be capable of handling all current games. Unlike many GeForce 600 series mobile graphics cards which use the latest Kepler architecture, the GeForce GTX 675M is based on the older 40 nanometer Fermi architecture. Based on the GF114 core from the previous GeForce GTX 580M that was the pinnacle of last year’s notebook graphics cards, the GTX 675M retains the same core, shader, and memory clocks as the GTX 580M and features 2048 MB of dedicated VRAM on a 256-bit memory interface. By comparison, the more expensive Alienware M17x R4 relies on the AMD Radeon HD 7970M graphics card which is based on a 28 nanometer process. As demonstrated by our tests using several versions of the 3DMark benchmark suite, the HD 7970M outperforms both the GeForce GTX 675M and the top-of-the-line Kepler-based GeForce GTX 680M. As a result, the M17x R4 scored higher than our Samsung test sample, albeit only marginally so. As expected, the weaker Radeon HD 6970M graphics card of the preceding Series 7 700G7A fell short of both GeForce 600 series models and the Radeon HD 7970M. 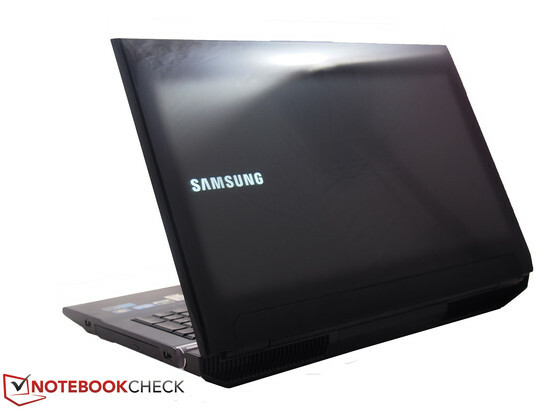 As a gaming notebook, the primary purpose of the Samsung Series 7 700G7C is smooth gameplay. Although the graphics card does not use the latest Kepler architecture, most games are nonetheless playable using maximum graphics settings at the native Full HD resolution. We tested a few games and summarize our results below. Starcraft 2, now two years old, did not have high graphical requirements even at the time of its release. When using less-than-maximum details, the 700G7C is capable of triple digit frame rates. Using maximum settings, the game maintained a good 59 fps. Occasional stutters might be noticed during massive battles during multiplayer games. Deus Ex: Human Revolution, a story-driven role-playing shooter from 2011, can be played using either DirectX 9 or DirectX 11. When using the former, the notebook managed over 200 fps. Using Ultra graphics settings and Full HD resolution, the 700G7C managed 50 fps on average. Mass Effect 3, the highly anticipated 2012 Bioware role-playing shooter, uses an engine which limits performance to 60 fps for all hardware configures. The Samsung notebook was able to achieve this limit even using Ultra settings. The Elder Scrolls V: Skyrim, another role-playing game from 2011, also makes use of a 60 fps limit. This limit can be deactivated by modifying a configuration (.ini) file but we were only able to surpass the limit with an achieved 75 fps on Low settings. On the other hand, the 700G7C nearly reached the software-imposed limit with an average of 55 fps on Ultra settings. For information on other games or benchmarks concerning the GeForce GTX 675M, please visit our detailed page on graphics cards or our comprehensive gaming benchmark chart. 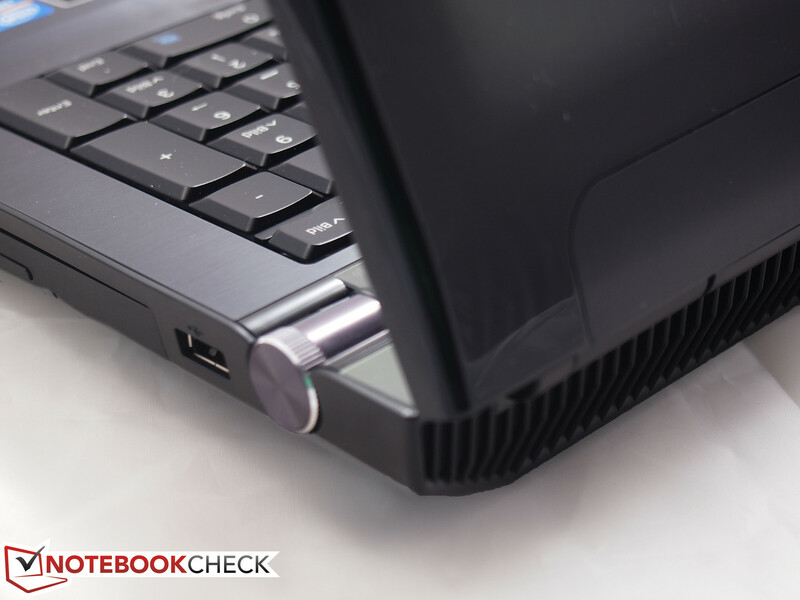 As one might expect, a high-performance notebook requires good cooling to maximize its potential. 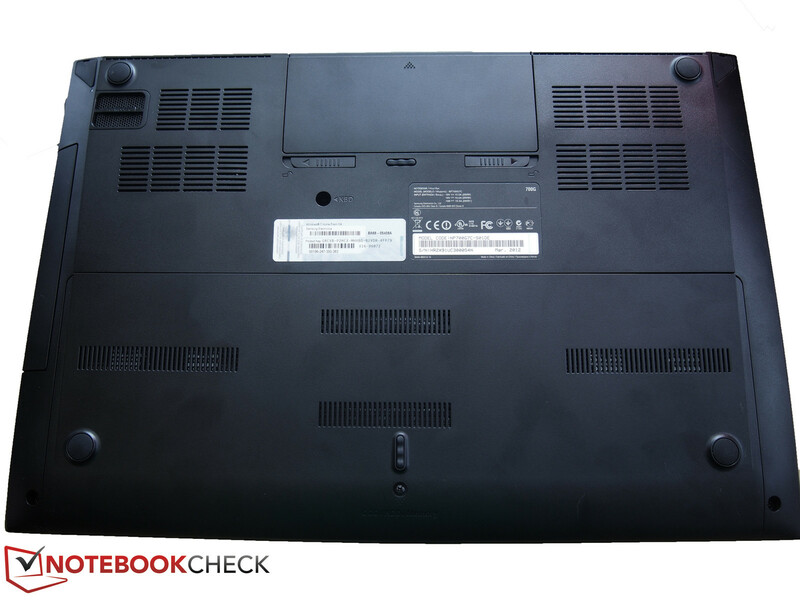 The Samsung Series 7 700G7C uses two large case fans to handle this. Despite their size, the fans were only audible during performance-heavy applications such as 3D gaming. While idle or surfing the Web, the device was agreeably quiet and nearly silent with the only noise coming from the hard disks during read/write activity. At maximum speed, the fans were also subjectively quieter than those of other notebooks. As previously mentioned, the fan speed can be controlled using an Fn key combination. 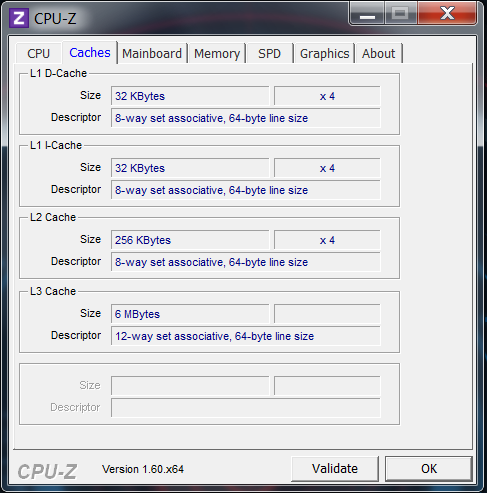 The “Library Mode” setting prioritizes low-noise operation. In our testing, we observed a surface temperature maximum of 55oC (131oF) during our extreme load stress test where both the CPU and GPU were pushed to 100 percent load. Even in this extreme case, the wrist rest remained pleasantly cool at 35oC (95oF). The underside also remained reasonably cool with a temperature of approximately 45oC (113oF). Waste heat was mostly felt at the device’s rear, a fact that illustrates a well-designed cooling system. As this load is unlikely to ever occur in practical use, the device should remain relatively cool even while playing sophisticated, demanding games. 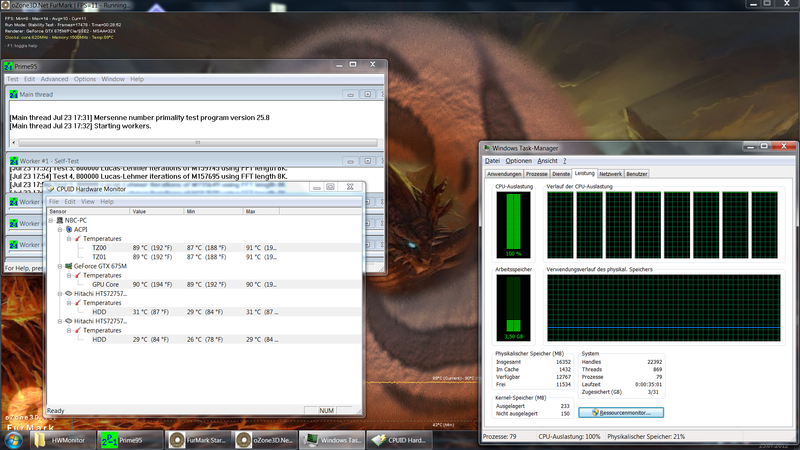 Our previously mentioned stress test is a combination of FurMark and Prime95. The purpose of our stress test is to push a system to its realistic limits to simulate a worst case scenario. In our stress test, the Samsung 700G7C’s Core i7-3610QM processor reached a maximum temperature of 90oC (194oF) across all cores and the processor clock remained stable at 3.1 GHz. 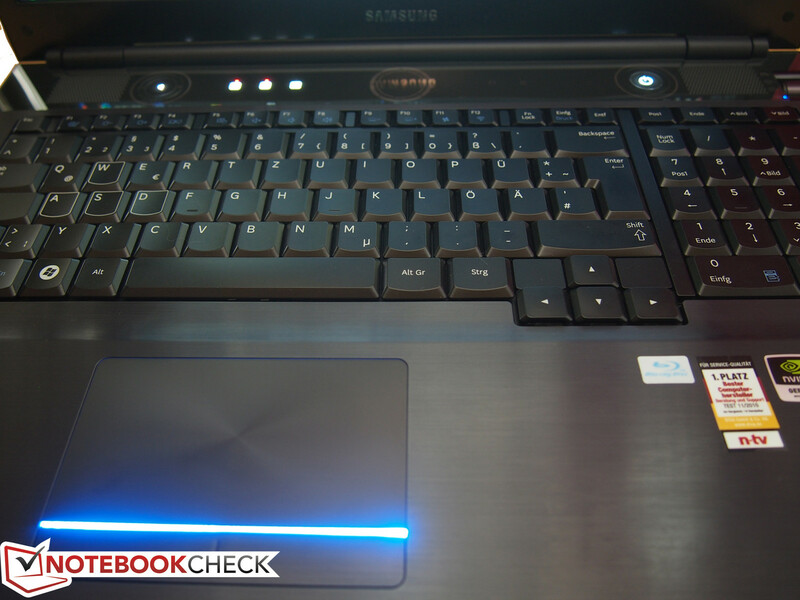 As a result, we can safely conclude that the Samsung notebook has sufficient cooling to avoid CPU throttling. Even in this extreme case, our 3D benchmark yielded comparable results to the previous cold state test, indicating no performance loss. As games rely on both auditory and visual stimulation, high-end gaming notebooks require good sound systems. For this reason, the Samsung 700G7C uses a 2.1 sound system composed of two speakers and a subwoofer. Compared to much cheaper productivity notebooks, we observed enormous differences in quality and maximum volume from our test device. External speakers, especially low-end ones, are entirely superfluous and likely downgrades. To further enhance the experience, the Dolby Home Theater v4 software enables precision audio adjustment. Audio output can be tailored to various situations such as movies, games, and music using the built-in software equalizer. 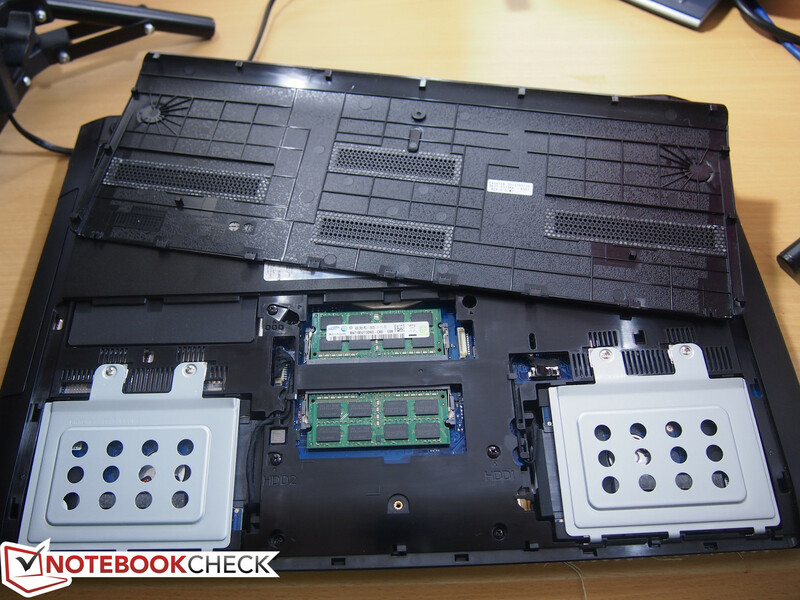 High-performance gaming notebooks typically feature power-hungry components. 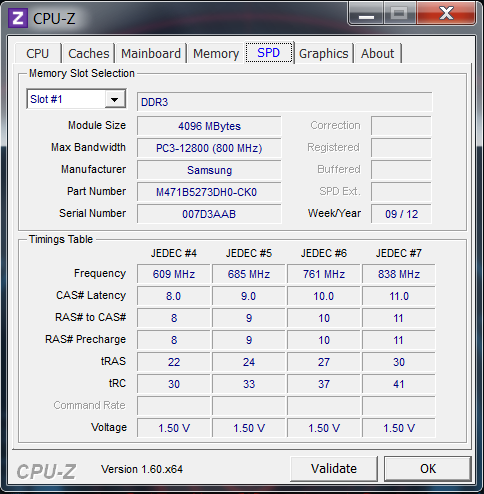 For our sample Samsung 700G7C, we observed power consumption levels of between 36 and 168 Watts depending on load. The preceding Samsung Series 7 700G7A and Alienware M17x R4 both have power consumptions in the same range. On the other hand, the Schenker XMG P702 uses Nvidia Optimus technology to switch to the more efficient integrated graphics card in idle and low demand applications. 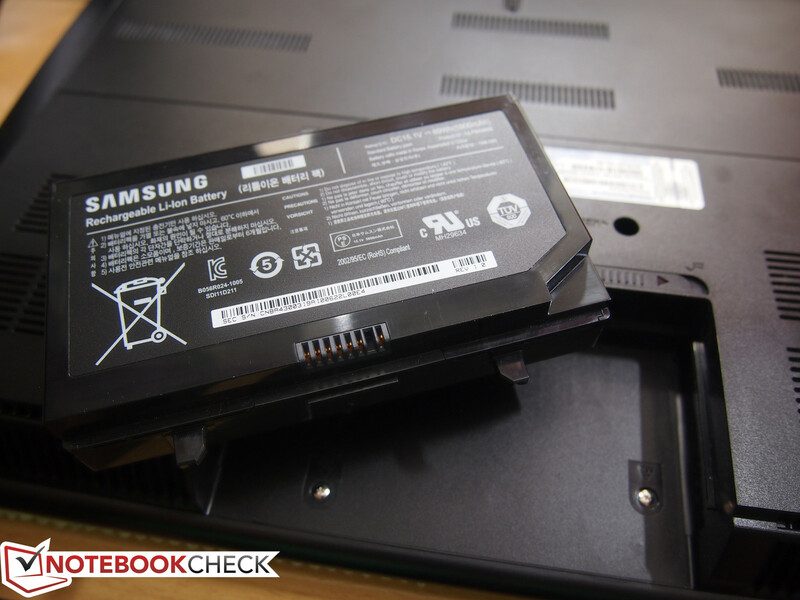 The Schenker notebook consumed only half as much as the Samsung notebook while idle and this lower consumption was reflected in maximum battery runtime. 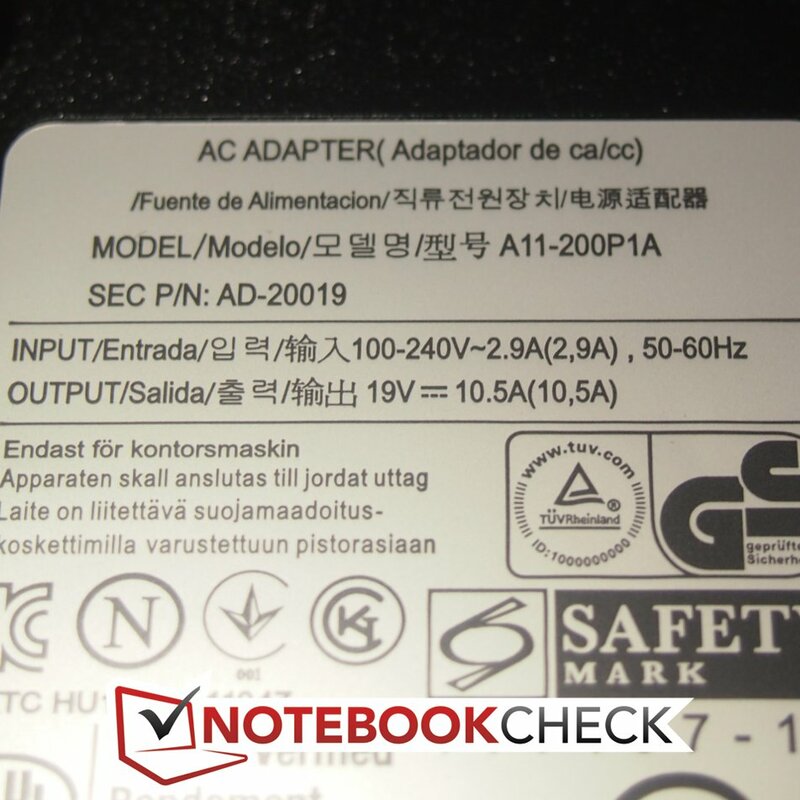 The Series 7 700G7C includes a power supply with a rated output of just under 200 Watts and is clearly sufficient for our notebook’s maximum power consumption. In order to offset the aforementioned power consumption, the Series 7 700G7C uses a generous eight-cell lithium ion battery with a rated capacity of 89 Wh. In theory, this fairly high-capacity battery should provide decent battery runtimes. 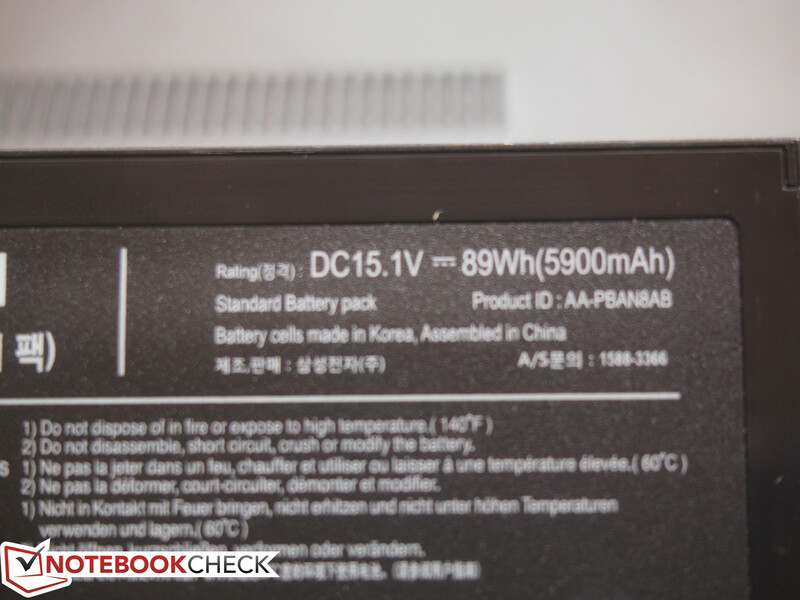 In order to compare the Samsung notebook with its competitors, we used the Battery Eater testing program. 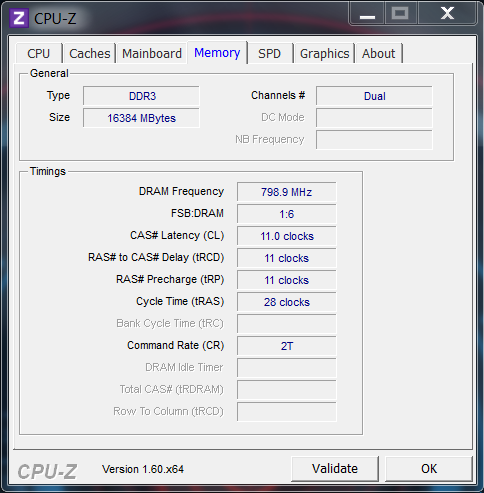 To simulate a minimum runtime, the Classic test runs a high demand simulation using the highest possible performance settings. 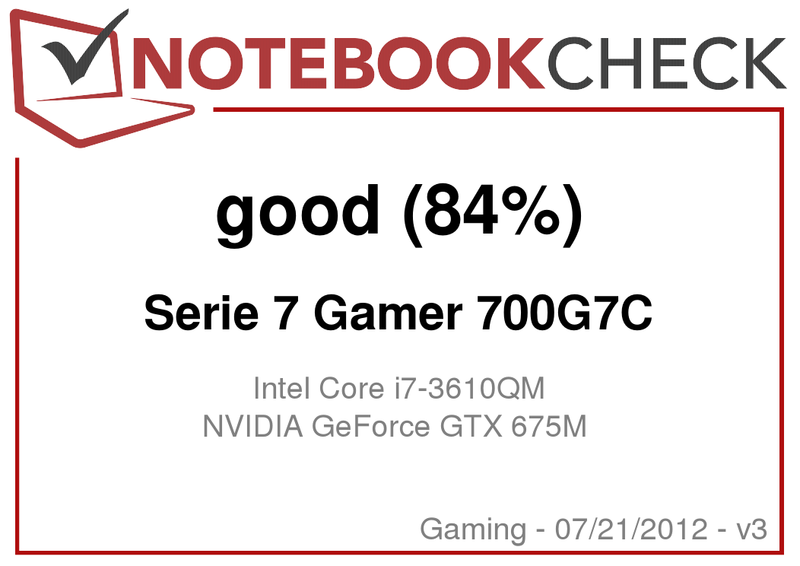 The 700G7C lasted an acceptable one and a half hours in the most powerful “Gaming Mode” setting. Other comparable devices such as the preceding 700G7A and the Alienware M17x R4 achieved just under an hour of battery operation. In our Wi-Fi surfing test, we used the “Balanced Mode” profile and medium screen brightness for 2 hours and 24 minutes before running out of power. This result is longer than the predecessor which only managed one and a half hours in the same test. 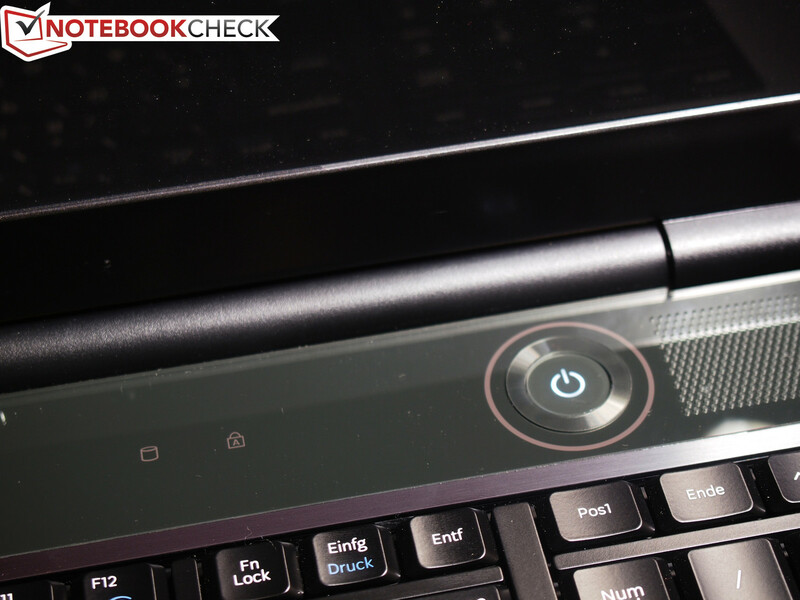 Even without Optimus, the Alienware notebook managed four hours in this test. Using the optical drive, we played a movie and the battery was drained in two hours. There was no observable runtime difference between DVD and Blu-Ray media. To simulate maximum battery runtime, we used the Battery Eater Reader’s test and observed a runtime of only 2 hours and 45 minutes. In conclusion, the Samsung Series 7 700G7C is a worthy successor to the Series 7 700G7A and is an exciting alternative to other established gaming brands. The notebook features high-performance equipment that should satisfy all gaming needs. 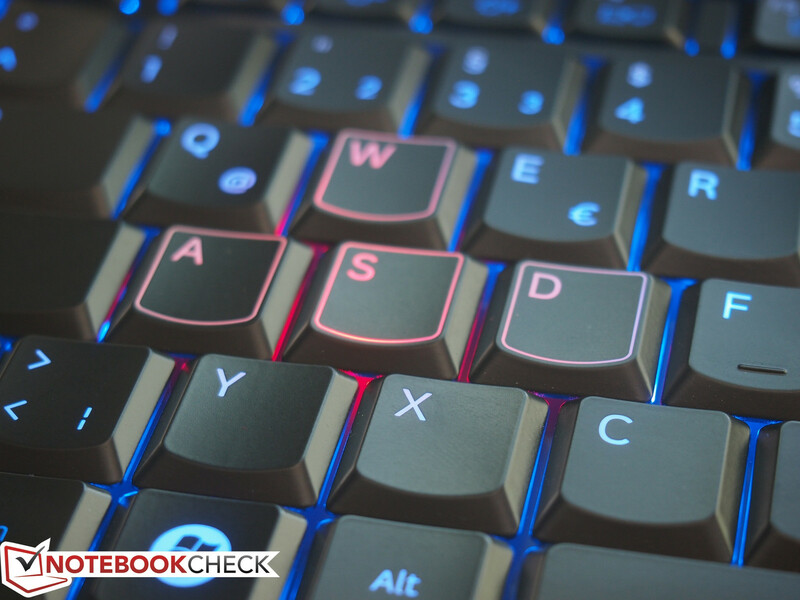 A variably illuminated keyboard and additional external controls such as the volume control and operation profile dial on the side help to define the notebook as a premium high-end device. We were pleased that the 700G7C did not sacrifice the predecessor’s strengths in this revision and that the current model features an excellent screen with very good brightness and contrast which is capable of outdoor use despite its glossy surface. On the other hand, we found the case quality to be simply middle of the pack but also free of any major flaws. While the display lid does not seem as stable as it should be for a high-end device, it is also unlikely to be a major issue for users. The glossy black plastic surface is attractive at first glance, but its sensitivity to fingerprints and scratching detracts from the otherwise luxurious impression. A tangible point of complaint is the lack of SSD that is typically standard in high-performance notebooks and should be obligatory in a device that costs nearly 2000 Euro ($2450 USD). Instead, Samsung chose a hybrid solution that makes use of an 8 GB “ExpressCache” SSD to speed up application startups and boot times. 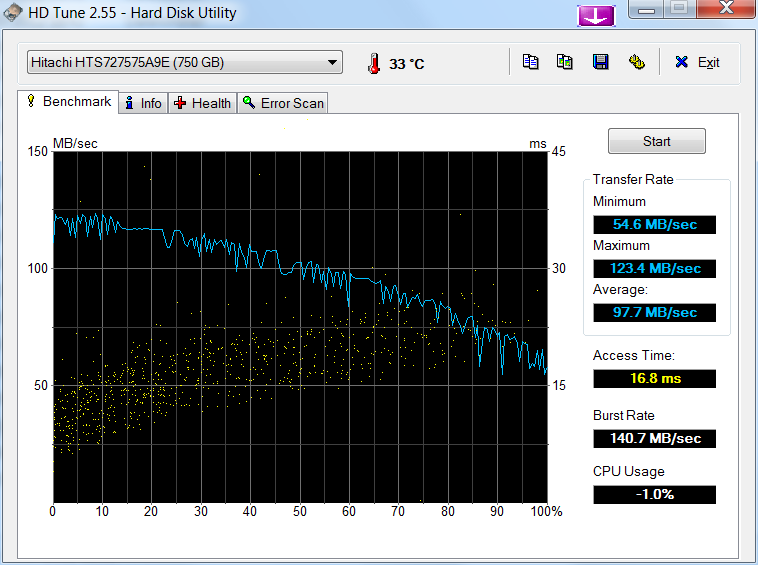 Unfortunately, this solution lags behind all pure SSD solutions. 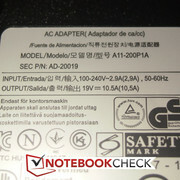 With a street price of approximately 1800 Euro ($2200 USD), Samsung charges a lot for the notebook’s prevalent advantages. The Schenker XMG P702, which has the same graphics card but an older Sandy Bridge processor, carries a comparable price. On the other hand, the Alienware M17x R4, with the same CPU but a slightly more powerful Radeon graphics card, costs a few hundred more. 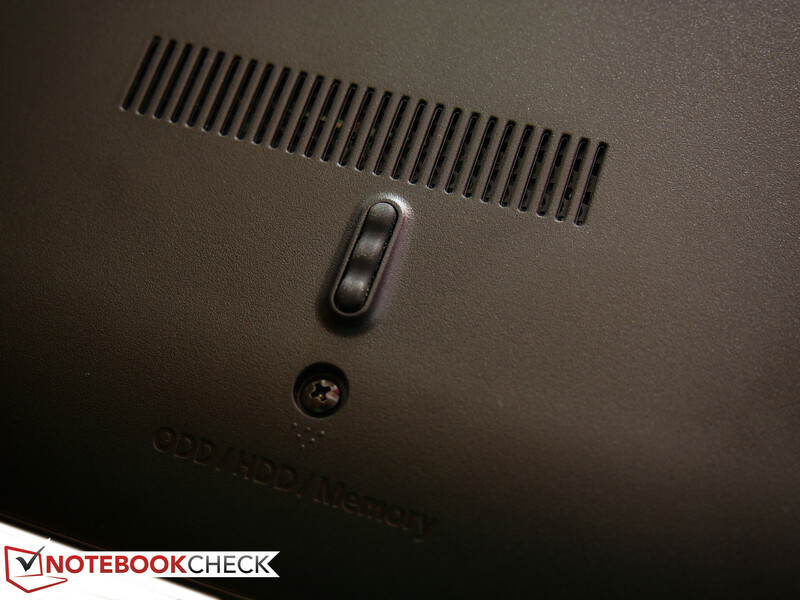 However, the Dell notebook also offers a wide range of CPU and GPU options including the newest Nvidia GeForce GTX 680M. Elegant piano black lacquer is sensitive to fingerprints. Four rubber feet keep the notebook stable. The battery is centered on the rear. One screw for removing the cover. The subwoofer is on the underside, at the rear right. A glued-on cover with screws beneath it. and has a capacity of 89 Wh. Opening for the hard disk and two of the four RAM modules. The rubber cover damps vibrations. Two 750 GB hard drives are in the notebook. The power supply is sufficient with an output of 200 Watts. The bottom looks cleaned up. A lot of stickers on the bottom. Good screen which is unfortunately reflective. The display lid is just as glossy. The notebook features stable hinges. A few status LEDs on the front left. Stickers and Dolby logo on the front right. HDD LED and illuminated power button. Dial for four operating modes. The Turbo lights up in Gaming Mode. Appealing illumination with additional handy controls. 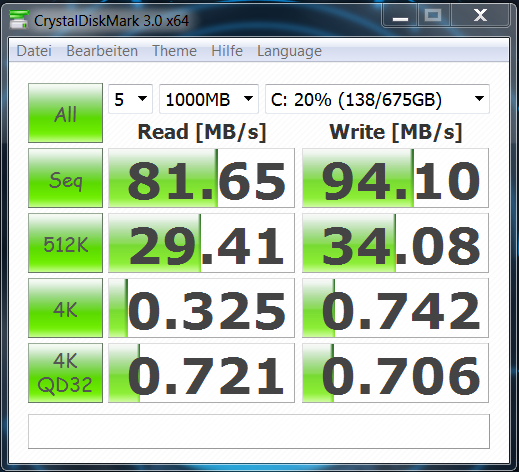 A SSD would have provided a clear performance gain. That Samsung does not offer any configuration options. Schenker XMG P702 with the same graphics card and extensive communication options. Alienware M17x R4 has the same CPU but more powerful graphics cards. Asus G75, a quiet high-end gamer.